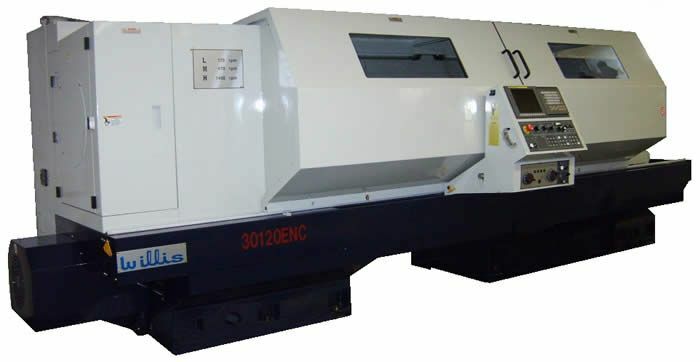 At Willis Machinery and Tools Company we provide oil country lathes to the large bore CNC lathe industry. Willis oil country lathes are great for heavy duty and dependable oil field applications. In addition, Willis CNC oil field lathes can also handle large pipes, rolls and other large diameter turning and threading applications. Our oil country lathes all possess the features of a Willis CNC lathe with the exception of having large spindle bores for larger, specialized applications. Willis Oil country lathes offer big bore users big solutions for the rigorous demands of the oil industry. Makes turning and threading big shafts a breeze. Great for oil field work. Makes turning and threading big shafts a breeze. Great for oil field work or conveyor rollers. The “Willis” PK 40120-10 large bore conventional lathe is great for the oil country. Our hollow spindle, geared head oil country lathes are designed to meet the demanding requirements of today’s oil industry. Due to modern energy concerns, the demand for oil country lathes is higher than ever. Willis Machinery is here to provide our customers with the highest possible value for their investment.